This is a detail shot of the large-scale installation that was the headlining piece at my recent solo show Reconstructions at Heller Gallery in New York City. The piece was based around the story of the Morgan Vase, a Chinese porcelain vase that was sold for $18,000 the same weekend as my opening March 8th in 1886. This caused such a controversy in the media that it sparked a fad throughout the US based upon the peach blow or Burmese color scheme (deep pink at the top, fading into white/cream at the bottom). 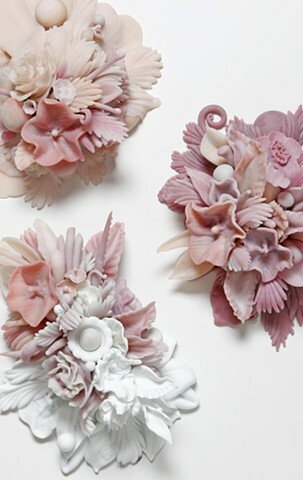 Peach Bloom was a term used to describe the original color of the porcelain wares.